We'd be better of with lower oil prices and a lower loonie, CIBC says. 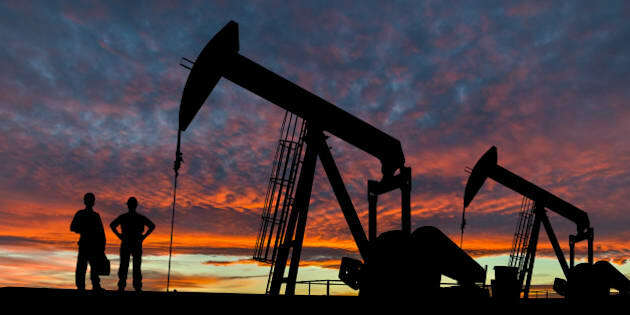 Silhouette of oil workers at an oil field pumpjack site against a dramatic sky. The silhouette of the fictitious workers were created in Photoshop. Tanking oil prices have driven up Canada’s unemployment rate, ballooned our government deficits and sent oil-exporting provinces into a prolonged recession. So oil prices bouncing back from around US$26 per barrel in January to around US$40 today should be good for Canada, right? Wrong, says CIBC deputy chief economist Benjamin Tal. Canada would be better off with $30 oil, he wrote in an analysis issued Friday. Why? Because the loonie moves with the price of oil, and when oil goes up, so does the Canadian dollar. And a higher currency could wipe out the competitive gains Canada’s exporters have seen since oil prices started falling. Tal notes that when crude prices bottomed out around $26 in January, the loonie was at 69 cents U.S. Now oil is around the $40 mark and the loonie has jumped to above 78 cents U.S. The idea is, if oil fell back to $30, the loonie would fall back down and help exporters. 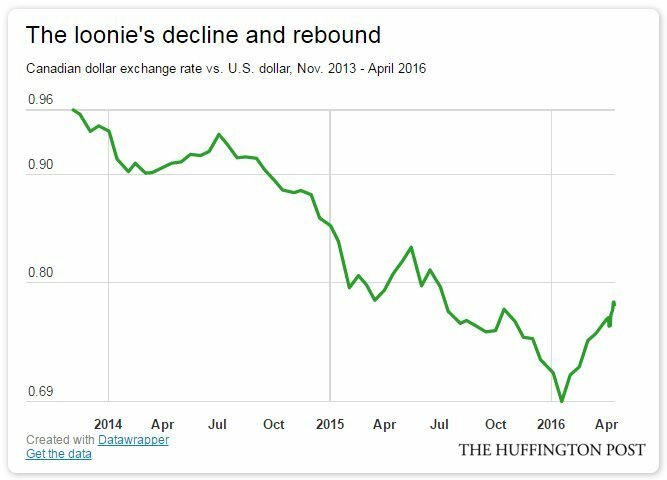 The Canadian dollar halted its downward slide earlier this year, when oil prices started bouncing back. CIBC's Benjamin Tal says we might be better off with the lower oil price, and the lower loonie. “When it comes to oil prices, we are in a no-man’s land,” Tal writes. But wait a minute, you might be thinking — $40 oil is still better for Alberta and the other oil-producing areas than $30 oil, isn’t it? Not necessarily. “For Alberta, the difference between $30 oil and $40 oil is not a game-changer,” Tal writes, because the cost of starting up new projects in the oilsands is so much higher than oil prices. Estimates in recent years suggest you need a $70 or $80 barrel of oil to convince anyone to launch a new oilsands project. “For the gain to be much more visible we will need to see a more significant increase in crude prices. For now we are in an oil twilight zone,” Tal writes. As if to prove Tal’s point, Statistics Canada reported Friday that Canadian manufacturing tanked in February, as the loonie began its climb back up from 69 cents U.S. The 3.3-per-cent decline was twice as large as what economists had been expecting, and was widespread: three-quarters of the manufacturing sector contracted, including the auto sector that was supposed to benefit particularly from a lower loonie. So yes, maybe we should be hoping for a $30 barrel of oil.